British television’s first drama was John Logie Baird’s 22-minute presentation in the summer of 1930 of Luigi Pirandello’s The Man with a Flower in his Mouth. That was long before the BBC began its regular television service from Alexandra Palace on 2 November 1936, and its first official drama production came four days later in the form of scenes from the Scottish romantic comedy Marigold. I have written about both of these productions and I am not about to challenge the primacy of either. But I have been pleased to discover recently that we can add a new “first” to these early productions of theatre plays for television. 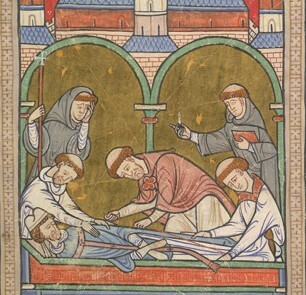 Eliot’s verse drama about the last month of Thomas Becket’s life in 1170 was first performed in June 1935 at the Canterbury Festival. The production then transferred in November to the Mercury Theatre in London where the critic for The Times hailed it as ‘the one great play by a contemporary dramatist now to be seen in England.’ (‘Mercury Theatre: Murder in the Cathedral’, The Times, 2 November 1935, p. 10) There was a radio broadcast early in 1936 and it was revived at the Mercury in September before it transferred to the Duchess Theatre at the end of October. While it was still at the Mercury, however, some of the cast, including Robert Speaight who took the role of Becket, went to Alexandra Palace for the test broadcast. Lessons learned from the test broadcast will have been applied when the production returned to Alexandra Palace before the end of the year, first on Monday 7 December for a broadcast as part of the official service and then again on Monday 21. Writing after the war, John Swift wrote that the production ‘marked the beginning of the use of symbolic effects. In the stage version Becket sees the temptations in flesh and blood; in television these were presented as ghosts whispering in his ear, by skilful positioning and “double takes” ‘ (Adventures in Vision, 1950, p. 50). Mr. G. More O’Ferrall has devised a rather inegnious means of giving the effect of scenery. At the moment it is not intended to disclose the secret of this scenery, but those who see the programme will be able to hazard a guess as to how the scenery has been done. This is the first time we have ever attempted the ambitious job of presenting excerpts from a play, complete with scenery. Of course we have had shows in which the actors have been in costume. It has been our custom in the past just to use black and white drop curtains. It seems most likely that what O’Ferrall was working with what came to be known as a Penumbrascope. A device that threw shadows onto backcloth, the Penumbrascope could be used to conjure up the effect of arches and vaults, and it was extensively used for dramas at Alexandra Palace both before and after the Second World War. Although such ‘scenery’ lacked detail and definition, it could be evocative and it had the great advantage of being quick to deploy and de-rig. 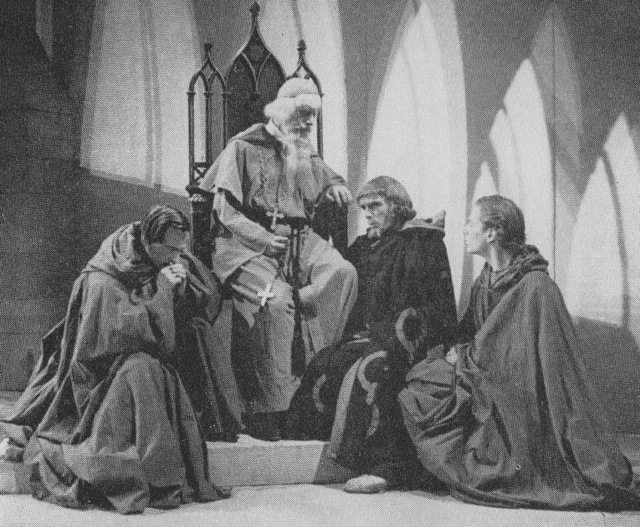 Drama producers used it frequently in increasingly elaborate productions of classic plays, as can be seen from the production image on the right from Stephen Harrison’s 1947 staging for the television service of Christopher Marlowe’s Edward II.